In less two weeks we are going to have our first TechDay this year. We want to thank our friends at CESNET for organizing it! This time the TechDay is a little bit different and instead of talks we will have an open session where people can ask questiosn on how to use OpenNebula. Experienced users from CESNET will answer your questions. We are still having the tutorial in the morning for people that never used OpenNebula. If you want to know more head to the TechDay page or head directly to the registration page, it’s free! Operating system (OS) level virtualization is a technology that has recently emerged into the cloud services paradigm. It has the advantage of providing better performance, elasticity and scalability than para-virtualization or full virtualization. This happens because HVM hypervisors need to emulate hardware and use a new kernel for each virtual machine that will be deployed. OS level virtualization follows a completely different approach. This technology allows you to share the kernel with the virtual portion of the system, in other words, the kernel is the same for the host and the “virtual machines” running on top of it. 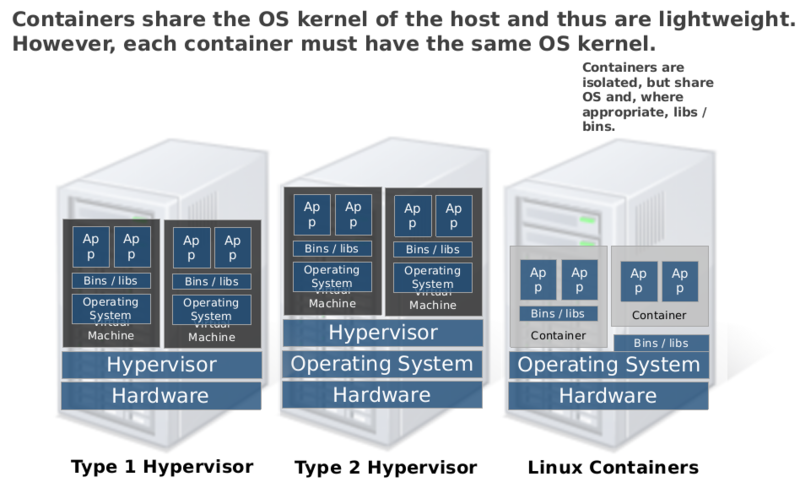 A container is a virtual environment, with its own process and network space that makes use of Linux kernel Control Groups and Namespaces to provide hardware isolation. Containers have their own view of the OS, process ID space, file system structure and network’s interfaces. Since they use kernel features, and there’s no emulation of hardware at all, the impact on performance is minimal. LXD is not just an Operating system level virtualization technology, it’s a hypervisor technology for containers. This means LXD containers look and act like virtual machines, but have the lightweight performance and scalability of process containers . LXD has proven dramatic improvements over HVM hypervisors such as KVM  and ESX  in aspects such as density, speed and latency. LXDoNe is an add-on that allows OpenNebula to manage LXD containers. It contains a virtualization and monitoring drivers. Right now it’s deployed in Universidad Tecnológica de La Habana José Antonio Echeverría‘s Data Center, alongside with KVM for special cases that implies a different kernel. We are actively working on adding more features and any reported bug will be prioritized by our team. Life cycle control: deploy, shutdown, restart, reset, suspend and resume containers. Support for Direct Attached Storage (DAS) filesystems such as ext4 and btrfs. Support for Storage Area Networks (SAN) implemented with Ceph. Limit container’s resources usage: RAM and CPU. Support for dummy and VLAN network drivers. Full support for OpenNebula’s contextualization in LXD containers (using special LXD images that will be uploaded to the market). Hot attach and detach NICs and disks. VNC session only works with the first machine on each node. This is the reason for this behavior. The driver has been released here. You can check there the installation guide for start using LXD with OpenNebula.